Coming in as WORST MOVIE OF THE YEAR so far, ‘The Nun‘ fails to impress on every level. I don’t say this lightly either. I’m a huge proponent of the horror genre and do believe that ‘The Conjuring‘, ‘The Conjuring 2‘, ‘Annabelle‘, and ‘Annabelle Creation‘ are some of the best modern day horror movies we have around. When we were introduced to this demonic nun un ‘The Conjuring 2‘, I had terrific nightmares where I had to sleep with the lights on. This character was horrific in a fantastic way. This nun was the hit of the ‘Conjuring‘ sequel for sure and now we have a whole entire film, simply titled ‘The Nun‘ that gives us a story about her from a couple of decades prior to the events in ‘The Conjuring‘. It’s not a prequel or origin story though as nothing about this demonic nun known as Valek is discussed. 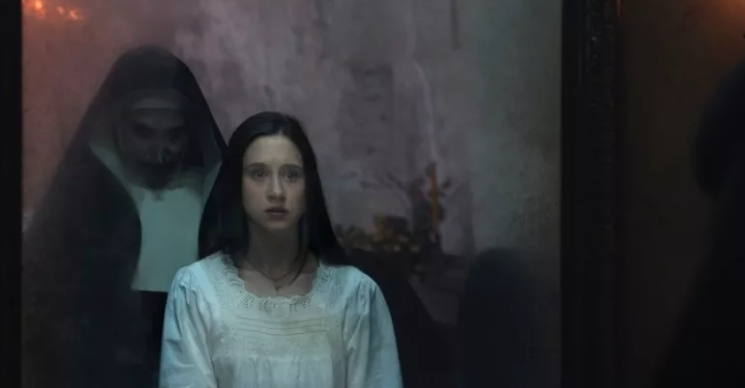 With a terrible screenplay, awful dialogue, dreadful editing, and camera movements, and not to mention stale performances – I prayed for the film to get better, but ‘The Nun‘ let me down at every turn. In fact, the film is so horrendous that I actually started to enjoy it on some comedic type of level. In 1952 Romania, where it seems like technology hasn’t made its way over to that part of the world yet, a Hogwarts sized abbey becomes the subject of an investigation after a nun sacrifices herself in a gruesome way. This abbey is creepy, haunted and evil to the point that the townspeople who live miles away curse it and even spit on the floor when its mentioned. This is where a priest and a young nun, along with a person from town heads to the abbey and figure out what happened there. They are treated to a bunch of noises, weird other nuns, demonic action, and apparitions that seem real, but aren’t. At one point, the main priest is forced into an open coffin six feet under the ground and is covered up instantly like he’s been buried for years. Once he is saved and asked how he got down there, his reply is something of the sort, “there is a great evil here, but look there are books in the coffin that wasn’t there before and must give us a clue”. You’d think we’d find a clue, but alas this aspect is not brought up again, but instead, cheap scares and scary nuns appear behind people and roar like a big cat. The film is so silly that you can’t help but laugh at everything happening on screen. At one point towards the end of the movie, it looks like the filmmakers ran out of their budget and instead of showing demonic faces on the nuns, they had to cover their faces with black pantyhose. I’m not kidding. 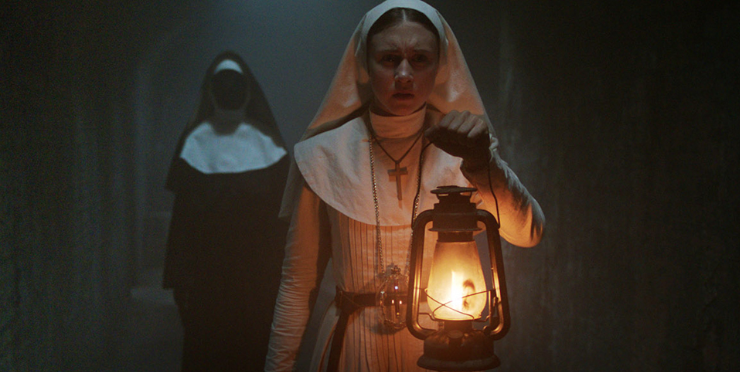 With some other horrible pieces of dialogue and zestless performances by more than capable actors, ‘The Nun‘ is not scary, or good by any means. Also, the connection to ‘The Conjuring‘ film is so bad that it is reminiscent of the “Martha/Martha’ fiasco in the DC Universe. Feel free to skip and forget this movie was ever released. Film Review: ‘Deliver Us From Evil’!! This entry was posted on Thursday, September 6th, 2018 at 12:47 pm	and is filed under Film, News. You can follow any responses to this entry through the RSS 2.0 feed. You can skip to the end and leave a response. Pinging is currently not allowed. « TV Review: The New ‘JACK RYAN’ Series!